Are food banks merely a sticking plaster for food poverty? Food poverty has been defined as the inability "to acquire or consume an adequate quality or sufficient quantity of food in socially acceptable ways, or the uncertainty that one will be able to do so". The extent of food poverty in the UK and on the island of Ireland is large enough to be declared a public health emergency with an estimated 8.4 million people struggling to afford to eat in the UK. In our recent book, The Economics of Emergency Food Aid Provision: A Financial, Social and Cultural Perspective, we review the provision of food banks and other emergency food aid with a focus on the UK. We argue that food banks must not be institutionalised as a permanent form of assistance in the UK as they have been in North America. This means not building infrastructure around them so that they do not became a permanent phenomenon. There is little doubt of the visibility of food banks on our streets, in our supermarkets through food drives, in the media and as a topic of conversation among politicians. 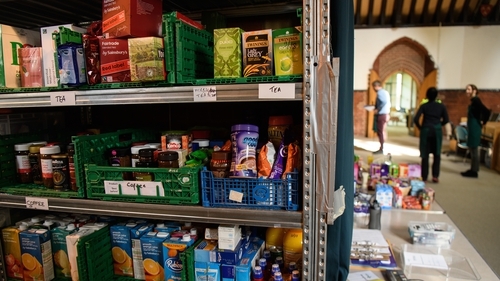 In the UK, there was a single, formally recognised food bank in 2001, but this number had grown to more than 1,100 by 2018. In Northern Ireland, there are more than 30 official food banks where there were none 10 years ago. Reliance on food banks has increased to the extent that the Trussell Trust distributed 1.3 million emergency food parcels in 2017-18, a 13 percent increase on the previous year. The causes of food poverty include insufficient income, benefit delays, benefit changes, debt and increasing housing and utility bills. All this is exacerbated by a low-tax, low welfare economy, where the agenda is to keep voters happy by keeping taxes low and penalising and demonising those on low-incomes. The narrative in political and media discourses is often around the "undeserving poor". Food banks are increasingly viewed as the go-to solution to food poverty and now stand as a metaphor for poverty in our society. It has meant the shifting of the governmentality of food, with food aid being dispensed by charities and not the state. Whatever good work food banks do, the existence of such an extensive network is testimony to the failure of public policy to protect and provide a basic minimum level of food security for the vulnerable. Food charity, as in food banks, should not be a permanent feature nor a substitute for social programmes that solve the root causes of food poverty. In our book, we set out to quantify the cost of restoring dignity to the recipients of social security. We put a social cost on the difference between a parcel of food as provided by a food bank and a consensual, acceptable basket of healthy, appropriate food which is based in everyday expectations of what is appropriate. We drew on existing research from food pricing in Northern Ireland, one of the most deprived areas in the UK. We compared both to average household spend on food. We call this the social cost of food aid and this works out as a threefold difference, as below. We also found that the charitable sector contributed approximately £9 million to feed our most vulnerable citizens at retail price levels. With respect to the cost of human dignity, can we afford not to address this? We declare food banks to be "successful failures": successful because they continue to grow and expand, failures because such initiatives distract from the causes of food insecurity without solving the underlying determinants that lead to such problems. Our analysis is that food banks are a symptom of austerity and government inaction which fail to tackle the underlying causes of food poverty. Developing an extensive network of food banks runs the danger of applying a sticking plaster as a means of addressing a problem which has deeper roots. Instead, we need sustainable, long-term, pragmatic solutions that address the policy issues under focus: low income, under/unemployment, job security, rising food prices and Welfare Reform. Food insecurity can only be addressed by governments guaranteeing their citizens a standard of living which includes a right to food, as laid out in the United Nations' Sustainable Development Goals: No Poverty and Zero Hunger. Dr Martin Caraher is professor of food and health policy at the Centre for Food Policy at City, University of London. Dr Sinéad Furey is a Lecturer on the Consumer Management and Food Innovation undergraduate degree programme at Ulster University Business School.